Today is Mcpotar's birthday and he chose to be selfless and gave us a birthday present on HIS birthday. 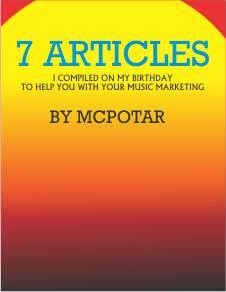 The 17-page ebook titled 7 Articles I Compiled On My Birthday To Help You With Your Music Marketing. I won't let the cat out of the back but it is definitely worth reading.